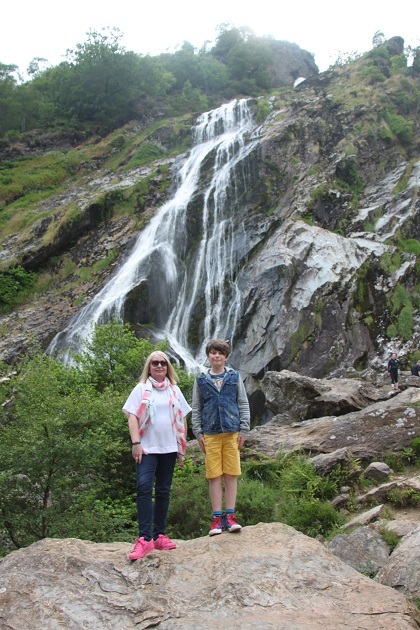 Time was ticking on when we left the gardens at Powerscourt and we feared we would have to give the waterfall a miss. Realising that it stayed open longer and later than the mansion and gardens and ascertaining it was just about a ten minute drive away suited us down to the ground. We decided we couldn’t leave without taking a look. 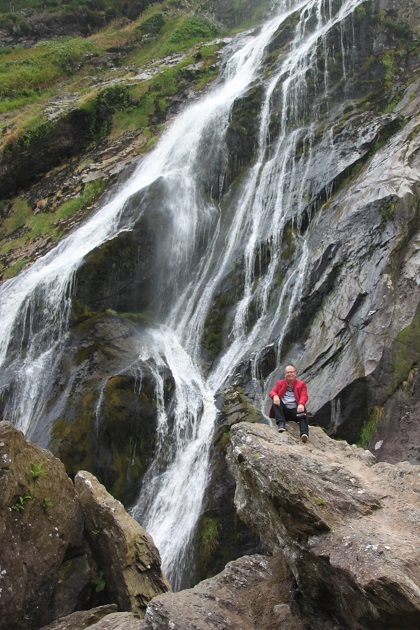 This is Ireland’s highest waterfall at 121 metres. We found it easily and paid (another fee) to enter the grounds. A lovely drive from the gate lodge to the waterfall through beech, oak, larch and pine trees. Some of these were planted over 200 years ago and I spotted some of my all time favourites too – the giant redwoods. We parked up and walked a super short distance to the waterfall. 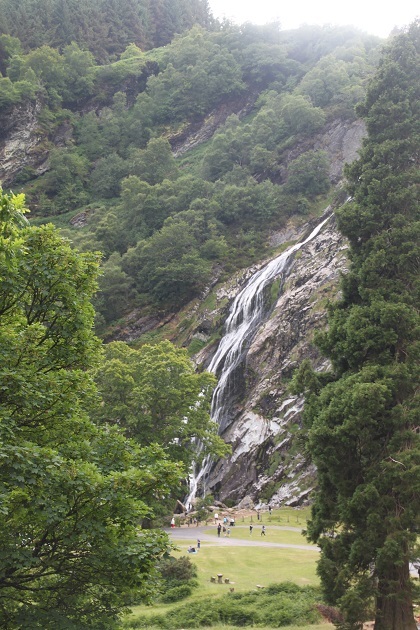 It tumbles down the Dargle Valley and has been a major attraction since the 1760’s. We were able to get up close and admire it from all angles – pretty special. Afterwards it was the drive from hell through Dublin at rush hour before we eventually emerged just about intact at the other side of the city. A quick look at Tripadvisor the previous evening meant we’d already sorted a place to have dinner later on – the Man O’War at Balbriggan. Good ratings led us to make a booking, glad we’d done our homework we would never have found this gem otherwise. In the middle of nowhere, rural to say the least, it is the most quaint and lovely building. All whitewashed with a thatched roof and milk churns outside, it was love at first sight for me. Inside did not disappoint either. Traditional with lots of quirky stuff around from old scales to musical instruments there was so much to look at. Friendly service from excellent staff and delicious food meant the perfect end to a great trip. Splendid photos of the waterfall and I wouldn’t mind visiting that charming pub too! Have a good weekend. We very nearly didn’t go to the waterfall – so glad we did as I wasn’t expecting how magnificent it would be, we loved it! The pub was just the icing on the cake. We have sunshine today, although icy cold – fingers crossed it lasts over the weekend!! Hope yours is a good one too. I’d definitely recommend this area if you visit Ireland Rosemary – completely unknown to us before this visit and we only had a couple of days there but found so many interesting things to see and do, I’m sure we only scratched the surface!! Not quite what we were expecting – we thought it would be nice but not as impressive as this! Oh my lands! That waterfall!!!! I loved that you included people near and around the fall to give me a sense of scale. The Fall is huge! Redwood trees? In Ireland? That’s fantastic! I love them too. When I was a girl we had one in our backyard. I spent so many hours climbing it, daydreaming, thinking, and planning my life in it. I would climb her as high as I could get, and would only stop because the upper most part of the trunk wouldn’t support me. I’ve been in love with trees and Redwood’s since. The restaurant looks wonderful! 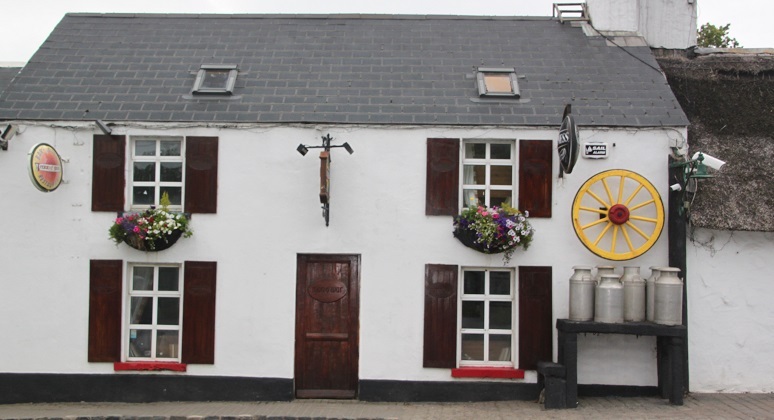 I love the window boxes overflowing with flowers along with the milk containers, thatched roof, and white-washed walls. I’ve always loved these trees – we have some not far away from us too in England, I think the wealthy owner of a stately home planted them years ago! We’ve been to the Sequoia National Park years ago and the trees we have here are not a patch on those – but it’s still great to see them in this country! 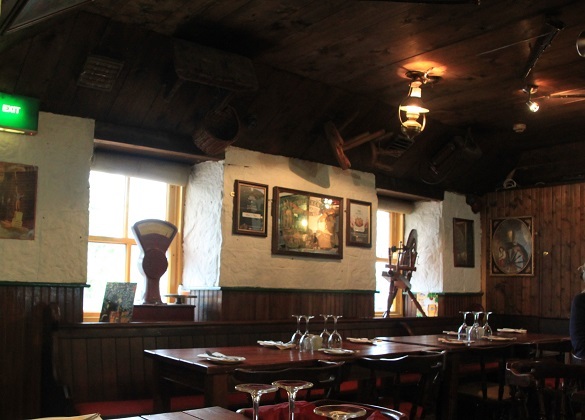 The little restaurant was so quaint and exactly what you picture when you imagine a traditional Irish place – so glad we stumbled upon it and inside was every bit as lovely. Great to see that there are redwoords in Ireland. I had no idea. They may be youngsters, but at least they are there. Very cool waterfall and the inclusion of the people really gives a sense of scale. Nicely done. They’re nowhere near as impressive as the redwoods we’ve seen in America, but like you say they are there!! The waterfall was just so beautiful, a real surprise in this area! We were blown away – weren’t expecting it to be quite so scenic or impressive as this! That is some waterfall and I like the pink shoes! Those are my hiking shoes – always love a bit of pink!! Joy, the waterfall is truly magnificent, and what a good find the restaurant was. It looked like the perfect day! It was Pam – nature at its finest followed by a delicious meal – wonderful! Such a beautiful waterfall, they are so mesmerizing. 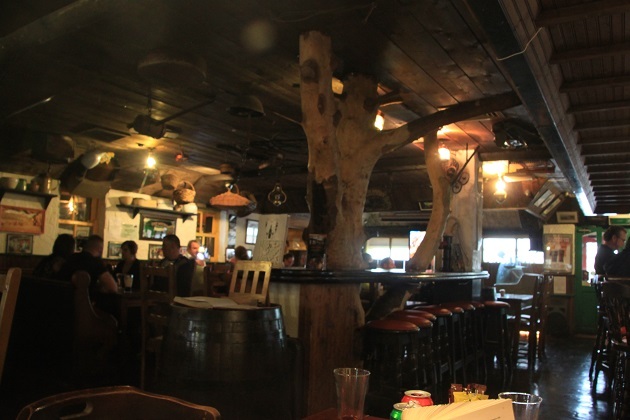 That restaurant also looks amazing, love the interior of it! The food was great too – lived up to the interior for sure!! It is beautiful – hope you get to visit sometime!